Calvin and I got home from church and I headed up stairs to change. As I came down the stairs Calvin shouts something. It sounded like “mumble mumble mumble and a robin redbreast too!” I absentmindedly responded with a “that’s nice” while thinking about lunch. A few minutes later Calvin says, “The peacock is moving!” At which point I started paying attention. 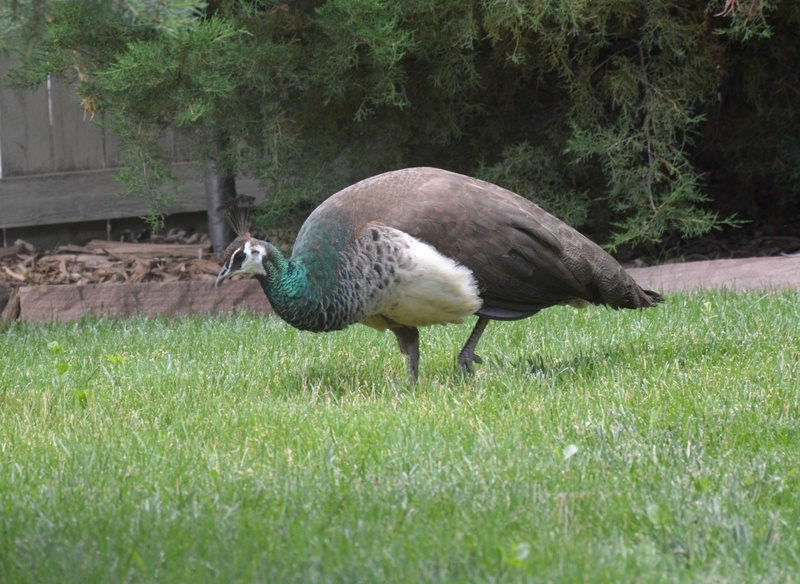 Yes indeed, there was a real life peacock in our backyard. Naturally, the first thing I did was grab Jaeger’s camera and start taking pictures. I don’t know much about how to take pictures with Jaeger’s camera so I pointed, clicked, and hoped for the best. After I got some pictures, I considered what I should do. Willow was outside sitting in the shade and seemed to be completely ignoring it, and vice versa. So, there didn’t appear to be any immediate danger for either animal. I looked up animal control and tried calling some numbers but didn’t get anything helpful. Eventually, I decided to call the Boulder Humane Society because they’re open on Saturdays and I figured they’d know who to call. The person who answered at the humane society seemed very bemused and patched me through to police dispatch who also sounded bemused and said they’d alert animal control. Have I mentioned our house is a bit hard to find? I saw animal control drive past twice before I was able to wave him down. 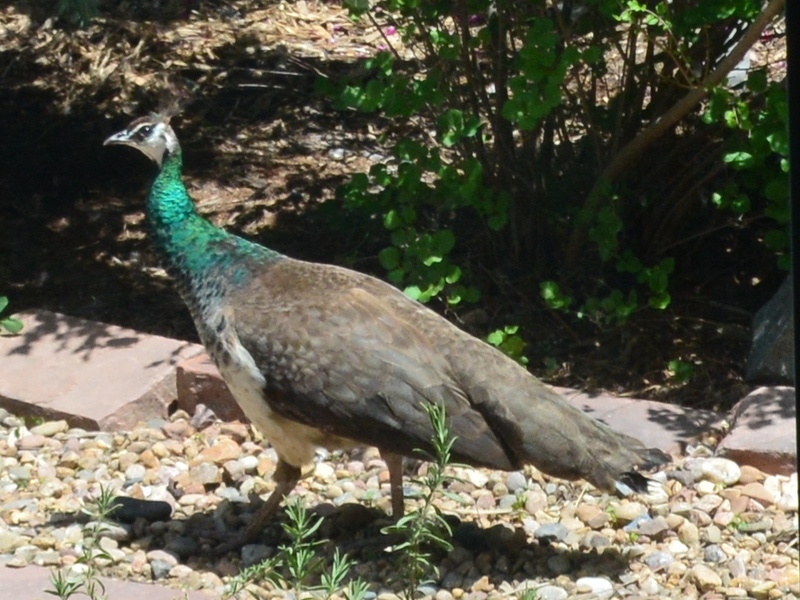 He came in to the house to peer through the window and verify that I was not seeing things, there was a peacock in our backyard. Apparently peacocks can fly in short hops so he wasn’t sure what his odds of catching the peacock were. He had gloves and a net and tried some subtle stalking of the peacock which the peacock was having none of. The peacock manage to elude him and either escaped or found a good hiding space. The animal control officer walked peered into our neighbors yard with no success. He then went across the street and struck up a conversation with the neighbor that flies a Scottish flag who apparently used to raise peacocks. However, she also hadn’t seen it. The officer gave me his card and told me to call if I saw it again. About ten minutes later, I saw it in our yard again. It might have been hiding in our yard all along. Our yard is full of excellent hiding places. I called dispatch again and was put on hold while they handled an emergency. Then he took my message. The animal control guy took my number and said he was going to go back to his office for a net gun and he’d call me again before leaving to make sure it was still there. Jaeger arrived home incredulous that he’d gone hiking around Long’s Peak and I’d seen more exotic animals than he had. I don’t think he believed me about the peacock till he saw it with his own eyes. The animal control guy arrived and chased the peacock around for a couple of minutes until it took refuge up on our neighbors roof. At the moment, it’s still there and doesn’t appear to be coming down anytime soon. This entry was posted in Misc on June 21, 2014 by kiesa.